A typical large city in the United States annually receives more than 10,000 complaints about rodent problems and performs tens of thousands of rodent control inspections and baiting services. To be effective, such large-scale rodent control operations require a detailed but concise plan, one that melds technical pest management expertise with interagency cooperation and public relations. People are very concerned about rodent control – and with good reason. Rodents consume and contaminate food with their fur, urine and feces. Rat burrowing causes streets and structures to collapse. Their constant gnawing damages property. This has caused power outages, Internet blackouts, computer crashes, fires and human deaths. It is estimated that 25 percent of all fires attributed to “unknown causes” are probably started by rodents gnawing on gas lines, electrical wiring and matches. Rodents also carry disease. A few centuries ago, 25 million people died of “black plague” – a disease carried by rats and transmitted to humans by fleas. Today, plague still occurs, even in this country, along with other rodent-borne diseases including leptospirosis, hantavirus pulmonary syndrome, rat bite fever and food-borne diseases. Rat bites threaten human health. Thousands of people are bitten each year. Many more are exposed to rodent dander, fur, urine and feces, found in nearly all inner city dwellings. About 20 percent of inner-city children become sensitized to rodent allergens and may develop asthma. Today, communities of rats exist within and beneath cities, traveling sewers and utility lines from building to building, only occasionally noticed by their human counterparts. 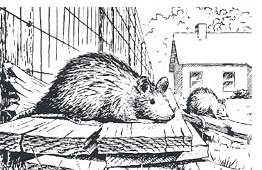 Each rat colony has its own territory, which can span an entire city block and harbor more than 100 rats. Each evening, as they explore their territories, rats and mice learn the locations of new objects, food sources and escape routes. A rat’s territory or “home range” is generally within a 50-foot to 150-foot radius of the nest, while a mouse usually lives within a 10-foot to 30-foot radius of the nest. In places where all their needs (food, water, shelter) are met, rodents have smaller territories. While mice tend to investigate new objects in their territories, rats are generally suspicious of objects that suddenly appear in their midst. Rats may ignore newly-placed rodent bait and traps for days or even weeks, especially if other food continues to be routinely available to them. The curious mouse may accept bait more readily; but to be effective, many closely-spaced bait offerings must be placed due to the mouse’s smaller home range. Also known as the brown rat or sewer rat, this is the rat familiar to most people. It is a dark, brownish-black rodent up to 9.5 inches long (excluding the tail) and usually weighs less than one pound. Its 6-inch to 8-inch tail is dark above and pale below. The Norway rat has a blunt snout and relatively small ears. Its droppings are about ½-inch to ¾-inch long with blunt ends. Rats may deposit 35-45 droppings over a 24-hour period. Usually weighing less than an ounce and growing up to 3.5 inches long (excluding tail), the house mouse is the most common rodent in urban and developed areas. Its coat is gray to brown, and the tail contains only a few hairs. Mice have pointed snouts and relatively large ears. House mouse droppings are slender, ¼-inch long and pointed. During a 24-hour period, a mouse deposits about 50-75 droppings. Other differences exist between rats and mice. Norway rats require about an ounce of water each day – one reason why they are often found in sewers and along rivers and streams. House mice, however, can survive on the water they absorb from foods. Norway rats prefer to live in underground burrows, but will live above ground in walls, ceilings and storage areas. Outdoors, mice will nest in burrows but will move into structures to nest in attics, wall voids, cabinets, appliances and furniture. Long-term rodent control for urban areas combines sanitation, exclusion and, when necessary, the use of traps and baits – what is called an integrated pest management (IPM) program. IPM is a program where 1) an inspection is made and pests identified before control is implemented; 2) the need for control is assessed along with the efficacy, cost, safety and environmental effects of control methods including environmental, biological, mechanical and chemical methods; and 3) after careful consideration, the best control methods are used to manage the pest. Rodent control begins with sanitation. While rodents find warmth and shelter inside structures, food is their first reason for living in and around structures. Thus, every effort should be made to eliminate rodent food sources in and around structures. Foods should be kept in sealed containers made of materials difficult for rodents to chew through, such as metal and hard plastic. Trash also should be stored in tightly sealed containers including trash cans and dumpsters with lids. Replacement of a municipality’s trash containers with “rodent-proof” containers should be a part of the city’s rodent management plan, especially for areas where rodents are a recurring problem. Dumpsters should be placed as far away from structures as is practical, equipped with tight-fitting covers, and have no holes larger than ¼-inch. Dumpster drain openings should be securely plugged. Dumpsters and trash cans, as well as the areas underneath and around them, should be kept clean. 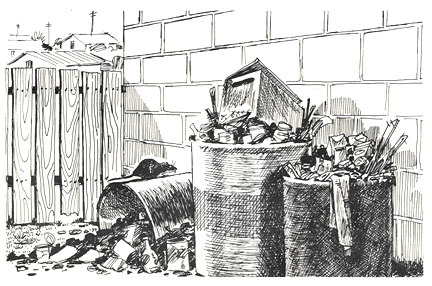 Trash removal should be regular and frequent enough to keep rodents from relying on dumpsters as a food source. For commercial food-handling establishments, this may mean having trash removed two or more times per week. Water management is also important for rat control. Outdoors, water should not be allowed to puddle around structures. Faulty grades should be filled to slope away from the structure. Gutters and downspouts should be kept free of debris. Water should not be allowed to stand around air-conditioning units. Also, correct indoor moisture problems. Repair leaking pipes and faucets. Don’t let water stand in sinks overnight. And keep lids on toilets – rodents have been known to drink water, and even urine, from toilets, and can enter structures by swimming pipes and emerging from toilets! As a rule, anything that will make a structure less hospitable to rodents should be considered important. Along with sanitation, exclusion is the first line of defense against rodents. As rats can enter structures through ½-inch holes and mice through ¼-inch holes, every effort should be made to seal these exterior entry points. This can be done with ¼-inch mesh metal screen or hardware cloth, metal “wool” products, concrete mixes or durable sealants for smaller openings. Where rodent activity is high, building construction should take into consideration the jumping and climbing abilities of rodents. Because rats can jump about three feet vertically, 3-½-foot bands of polished metal or gloss paint should extend up from grade level around the structure. To help prevent rodents from burrowing under the structure, a metal band should extend two feet below grade. Often, rodents enter structures through doors. Doors should be kept closed, should clear floors by no more than ¼-inch and have metal kick plates attached to prevent rodents from gnawing on them. Twelve-inch metal collars can be attached to support poles, pillars and vertical pipes to prevent rodents from climbing them. Exterior vents and floor drains should be covered with screens or grates sufficient to exclude rodents, and spaces around drains should be filled with cement. Sanitation and exclusion work together to enhance the effectiveness of trapping and baiting; all are components of an integrated rodent management program. Removing food sources and restricting rodent access forces rodents to roam farther away from their nests in search of food, making their contact with rodent traps and baits more likely. The use of rodent traps and/or baits depends on the situation. As with any IPM program, the best methods are selected after careful inspection, pest identification and assessment of the situation. While baiting is often the best way to quickly control sizeable rodent infestations, in many situations trapping has advantages over baiting. Trapping does not use pesticides. Trapped rodents can be discarded so no odor problems result. And trap catches may be a more accurate means of assessing the size and characteristics of a rodent population. Traps are most useful against mice, because mice tend to be curious and rats suspicious. For mouse control in public buildings, snap traps and multiple-catch traps can be used. One multiple-catch trap can trap a dozen or more mice -- without the use of bait or pesticide. Unlike snap traps, multiple-catch traps are not useful against rats. The use of glue traps (glue boards) should be limited. This type of trap consists of a sticky film of glue applied to a backing of cardboard, wood or plastic. These traps can fail when they get dirty, too hot or too cold. To help keep them free of dirt and moisture, glue trap covers can be used, or the traps can be placed in boxes with openings, in empty bait stations, etc. Nevertheless, savvy rodents will avoid them, vault over them or place debris on them to cover the sticky surface. Despite the many problems associated with their use, glue traps do catch rodents and can play a part in an integrated rodent management program. They can be purchased in both mouse and rat sizes. Still, the best all-around trap for both mice and rats is the trusty snap trap. Modern snap traps have expanded plastic triggers proven to catch more rodents than older traps with smaller, metal triggers. Correct use of snap traps begins with proper placement. Along walls (rodents tend to run along walls), snap traps should be placed perpendicular to the wall, with the trigger end against the wall. They can also be placed in tandem (back-to-back), parallel to the wall so that rodents traveling in either direction will encounter the triggers. Although unbaited snap traps catch rodents, they work best when baited with food attractive to rodents. Bait with crunchy peanut butter, nuts, meats (e.g., bacon, hot dogs, sardines), fruit or sweets. For mice, cotton balls and dental floss are also attractive as nesting materials. Dental floss is also advantageous for tying baits onto snap trap triggers to keep rodents from stealing the bait. For rats, use rat-size snap traps. Other strategies include “pre-baiting” snap traps without setting them. Pre-baiting allows rats to get used to their presence and begin feeding on the bait. Once routine feeding occurs, the triggers can be set. 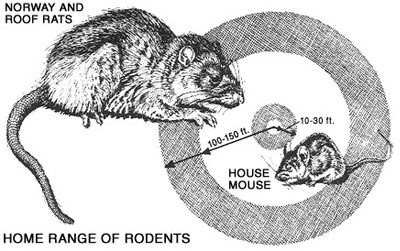 The object is to maximize the number of rodents caught and minimize the number of escapes that can make rodents increasingly wary. Traps also can be covered with thin layers of meal, grain or sawdust to help prevent rodents from detecting them. 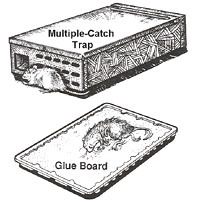 While snap traps are useful in many situations, large numbers of them must be used to control larger rodent infestations. Snap traps should be placed at 10-foot intervals for mice and at 20-feet for rats. Half a dozen snap traps will capture a couple of mice in someone’s kitchen, but two dozen may be required for a typical restaurant storage room, and many more in a warehouse. Thus the use of snap traps is generally too labor-intensive and time-consuming to be practical against large infestations. Baiting rodents with rodenticides is another effective means of control. Often, baiting is the most efficient and timely way to eliminate large numbers of rodents. The main disadvantage is that rodenticides are toxicants and must be used carefully to avoid harming people, pets and other non-target animals. As with all pesticides, precautions (and associated risks) must be taken when using rodenticides. All rodenticide product labels emphasize that baits must be secured in tamper-resistant stations or placed in areas (crawlspaces, attics, sewers) inaccessible to children and non-target animals. Tamper-resistant bait stations are designed to prevent children and non-target animals from accessing bait. They are usually made of hard plastic or metal. They must be lockable and secured to the ground, a fence or a structure. Cable ties can be used, especially for attachment to fence lines. Stations also can be fastened to the ground with stakes, or attached to patio blocks by bolting or gluing. The use of patio blocks is advantageous in elevating stations above ground level moisture problems. The stations also must lock, usually by built-in lock and key mechanisms, and the bait blocks inside should be secured with wire or skewered on metal rods designed for that purpose. Bait stations should be numbered and labeled, and their locations mapped. A label on each station should warn of the rodenticide within, and include the user’s name and contact information. The station should also have a card or label on which technicians can record the date each station is checked. Around larger commercial facilities experiencing significant rodent activity, bait stations are often placed 75-feet apart around fence lines, spaced at 50-foot intervals against the building’s exterior, and indoors at 25-foot intervals along exterior walls. Such spacing can be made smaller or larger, to match the level of rodent activity. If bait is consistently being taken only along one corner of a structure, it may be beneficial to move bait stations from other areas to that corner, or simply to add more stations to the area experiencing the greatest rodent activity. In addition to using bait in bait stations, bait can be placed directly into rodent burrows. The bait should be placed deeply enough to be considered inaccessible to humans and non-target animals. 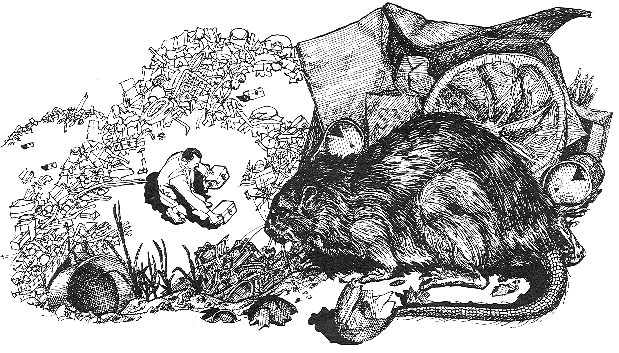 Burrows, especially those of rats, can be checked for activity by stuffing newspaper, leaves, etc., into the openings, then checking 24 hours later to see if rodents have reopened the burrows. If activity is noted, a cup of bait pellets (not block bait or place packs, due to their greater potential for being kicked out of the burrow) can be inserted deep into the burrow. A few days later, the burrow can again be checked for activity to see if the rodents were eliminated. Rodenticides come in a variety of forms and formulations. Bait blocks are preferred for use in bait stations. Grain, pellet baits and pellets in place packs can be shaken out of stations and translocated (carried away) by rodents, creating a potential for poisoning non-target animals. Liquid baits also are available. These can be used effectively where rodents (especially rats) have ample food resources but limited access to water. Like solid baits, liquid baits should be housed in tamper-resistant containers or be placed in areas inaccessible to children and non-target organisms. Selection of which bait product to use is also specific to the situation. Considerations include rodent acceptance of and resistance to the rodenticide, the amount necessary to kill a rodent (single or multiple feedings), the bait’s toxicity and secondary poisoning potential, and the potential for contaminating food and poisoning non-target organisms including humans. Municipal rodent management programs face many challenges. First, the program should utilize thorough and up-to-date knowledge of rodent control. This includes knowledge of rodent biology, IPM practices, rodent control devices, and the characteristics and risks associated with rodenticides. Such knowledge is critical not only to achieving successful control but also to providing the public, proactively and on demand, with information on the city’s rodent control program. Often, public information is best provided before it is requested. Proactive public education can prevent misconceptions and misinformation from arising, and thus save program employees time that might be spent answering questions from the public, special interest groups and media. Public education is a necessary component of municipal operations, and this is certainly true for rodent control programs. To facilitate the handling of questions, as an additional means of disseminating information and to expedite the reporting of rodent problems, a “hotline” can be established and publicized. Once in operation, the hotline will not only make it easier for the public to get information, but also consolidate the city’s response so that questions are not directed to staff of different city departments unfamiliar with all aspects of the program. Program information could also be incorporated into the city or local health department Website, allowing computer users to quickly ask and receive the information they seek. Dissemination of information also might take the form of informative fact sheets distributed to private residences, landlords and property owners, schools, food-handling facilities, businesses and institutions. To save on delivery costs, the fact sheets can be enclosed in city mailings such as utility bills. Additional flyers and perhaps seminars could be delivered to businesses and provide general program information as well as information on city codes and compliance pertinent to rodent/pest control. Municipalities also should ensure the existence of a clearly defined legal code. This enables rapid response to complaints and enforcement to eliminate conditions conducive to rodent propagation. Municipal codes should provide for the abatement of potentially unsanitary conditions attractive to rodents, such as trash in open containers, accumulations of junk and clutter, overgrown and noxious vegetation, stagnant water sources and improperly maintained structures. Rodent management programs cannot rely solely on traps and bait. Proper code enforcement is a key component of effective rodent management. Rodent proofing and control guidelines also should be established for food handling, storage and feed facilities, and for properties where new construction, demolition or other land disturbance is to occur. Establishments should generally be required to ensure 1) the integrity of structures through regular inspections and maintenance, 2) sanitary conditions by adequate cleaning, trash removal and use of rodent-proof containers, 3) the rodent-proofing of structures by sealing entry points and maintaining landscaping that does not encourage rodent harborage, 4) effective structural pest control service, and 5) the training of employees in established standards of operation that help prevent and reduce rodent infestation. Codes also should empower public health and sanitation inspectors to issue “stop orders” that shut down operations until rodent-conducive conditions are corrected. When violators fail to comply within a given period of time, the municipality may intervene to correct the offending conditions, or contract to have them corrected, and then bill the offender for these services. Penalties such as fines also should be well defined with scales appropriate for private, commercial and repeat offenders. Despite well-written and enforceable city codes, city courts may view rodent harborage and sanitation issues as minor and assign them low priority, or dismiss them altogether. This view can cause long delays in the prosecution of violators, issuance of penalties and clean up of rodent harborages. Such lack of urgency provides another reason to conduct a thorough information campaign emphasizing how rodent infestations threaten human health and explaining the city’s commitment (time, money, etc.) to its rodent management program. Failing this, case processing can be taken out of the courts and placed in arbitration or administrative review to streamline resolution. The federal Food, Drug and Cosmetic Act (FDCA) gives the U.S. Food and Drug Administration (FDA) the authority to inspect food and drug manufacturing plants and warehouses for the presence of filth, insect and rodent contaminants. The United States Department of Agriculture (USDA) conducts similar inspections in meat and dairy processing plants. The federal Insecticide, Fungicide and Rodenticide Act (FIFRA) governs many aspects of pest management and provides a basis for enforcement to ensure that all pesticide applications are performed according to label directions. “The label is the law” -- means product labels are legal documents that applicators should read and periodically reread to make sure they use the product correctly and note any changes in its labeling. Local and state pest management and pesticide applicator regulations also govern the training, licensing and certification of pest management businesses and pesticide applicators. In Illinois, rodent control is regulated by the Structural Pest Control Act and Code. Note that control of all other mammals, e.g., bats, opossums, raccoons, ground hogs, chipmunks, etc., is regulated by the Illinois Department of Natural Resources. Commercial pest management technicians must be certified or supervised by someone who is certified, in rodent control by the Illinois Department of Public Health. Municipal employees, however, are not required to be certified unless they wish to purchase or apply restricted-use pesticides (most rodenticides are general-use pesticides). In all cases, employees should receive rodent control training and adequate supervision. Responsibilities assigned to city departments vary from city to city, and several departments may be sharing the various responsibilities of rodent management. The city’s water/sewer authority is responsible for inspecting and perhaps managing rodents in sewers. The public works department may be responsible for trash removal and maintenance of trash containers and trash collection facilities. The city housing authority might be charged with maintaining rodent and vegetation control programs on public properties and with overseeing municipal pest management contracts. Parks and recreation departments may dispose of trash and conduct rodent and vegetation control for public facilities. And the local department of public health should provide public information on pest and pest-borne disease control, along with technical support for pest abatement and pest-related enforcement. Perhaps the greatest challenge for municipalities working to develop rodent management programs is that of integrating the various city departments into a cohesive unit. Designating an “interagency task force” may be the first step in formulating a municipal rodent management plan. Agencies such as the public health department and university extension service can provide information and expertise on rodents and rodent control. Once the required integrated rodent management methods are determined, department(s) responsible for implementing those methods can assess needs. Likewise, public information can be composed and plans made to disseminate that information. In the end, the key to a successful municipal rodent management program is to form a task force, to coordinate city departments and to formulate a robust rodent management plan that can be expanded and contracted as needed in response to variations in rodent infestation levels. Such a plan successfully balances program costs with public awareness, health risks, regulatory enforcement, abatement, maintenance and, especially, sanitation. NOTE : When pesticides are used, it is the applicator’s legal responsibility to read and follow directions on the product label. Not following label directions, even if they conflict with information provided herein, is a violation of federal law. Some of the images in this document were borrowed from Centers for Disease Control and Prevention publications. For more information, contact the Illinois Department of Public Health, Division of Environmental Health, 525 W. Jefferson St., Springfield, IL 62761; 217-782-5830, TTY (hearing impaired use only) 800-547-0466. 1. Perry, et al., “The Prevalence of Rat Allergen in Inner-city Homes and its Relationship to Sensitization and Asthma Morbidity,” Journal of Allergy and Clinical Immunology (August, 2003) pp. 346-352.